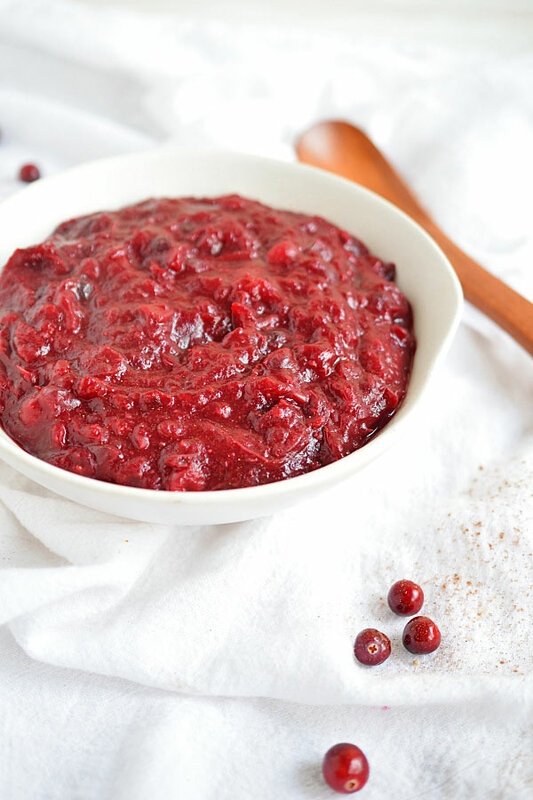 Delicious and healthy cranberry sauce in 5 minutes and only needing 5 ingredients. Oh yes, this one has got to be favorite eat-with-everything winter staple. Simply spiced with warming spices and sweetened with just enough dates to enhance the cranberry flavor. 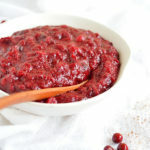 Cranberry sauce is one of those side dishes that takes me back to my childhood and Thanksgiving/Christmas memories. I never liked that canned, weird cranberry jelly stuff that held the shape of the can and jiggled back and forth (man, who came up with that nasty stuff???). But, I always loved the real, homemade kind that still actually resembled whole cranberries. Unfortunately, even the homemade kind is usually packed with a lot of refined sugar. I looked up the content in the average store-bought can and it’s shocking. Of course it’s full of high-fructose corn syrup with over 5 teaspoons of sugar in one 1/4 cup serving. Hello sugar! When you think of how little sugar is actually present in whole, fresh cranberries, you know that almost all of those 5 teaspoons are added sugar. But this recipe is not that. Mine is simply spiced with warming cinnamon and ginger, and sweetened with my date paste. The date paste is added until just sweet enough, and the spices and vanilla help to enhance the naturally sweetness without using sugar. How many cranberries do I start with? The amount of final sauce is about 1/2 the size of the amount of cranberries started with. The amount of date paste used is dependent on your sweet or tart preference. I love that tart cranberry so use very minimal, but add small amounts of about 1 tablespoon until just sweet enough. You need less than you think! You can adjust how “saucy” or thick the final cranberry sauce will be by adding more water. 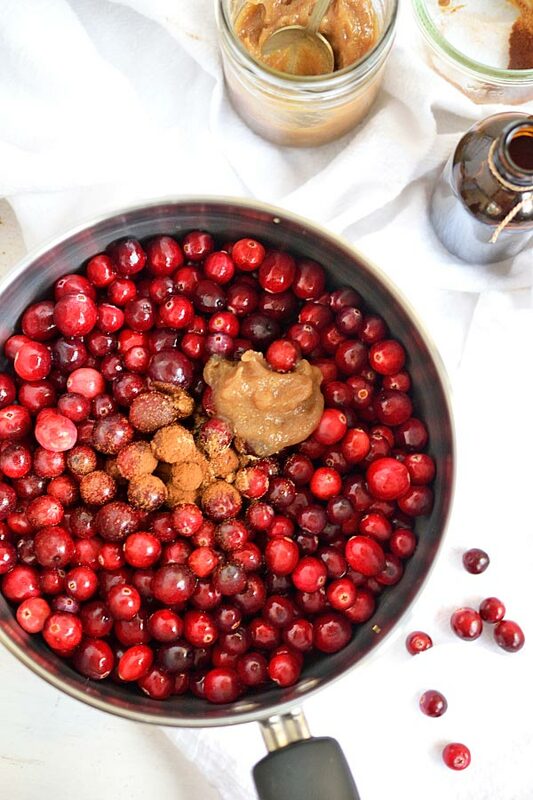 Place cranberries in a high-speed blender or food processor. Blend on high, adding water to help blend to desired consistency, leaving chunky or blending until smooth. Stir in the date paste, cinnamon, ginger, and vanilla. Add the date paste in about 1 tablespoon or spoonful increments until sweet enough to your liking. Start with a capful of vanilla extract or about 1 teaspoon of powder, and as much cinnamon and ginger as desired depending on preference. I love the cinnamon and just keep shaking until it's just how I like. Taste and continue to stir in more as you like. Finish by stirring in a pinch of salt. Serve as is or warm slightly if desired. if you desire to prepare the cranberries on the stove top, lightly simmer the cranberries with about an inch of water in the bottom of the pot until they pop and break down.